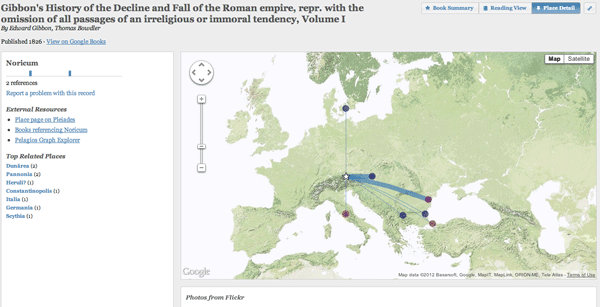 GapVis (Google Ancient Places Visualization) allows readers the ability to geographically explore text covering ancient places. 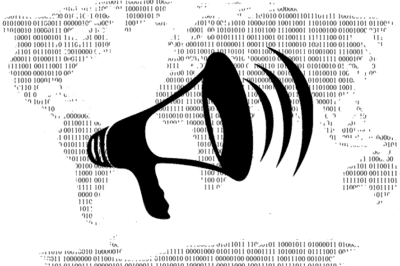 The endeavor is backed by $50,000 in funding from Google’s Digital Humanities Awards Program. The project is led by a team of academics and is based out of the University of Southampton. The Edinburgh Geoparser has been modified for the purposes of this project in order to geotag references to ancient places in the text and then georesolve them to a gazetteer. Pleiades+, a toponym extension to Pleiades, is used to resolve ancient place names with contemporary names to be able to geocode them. 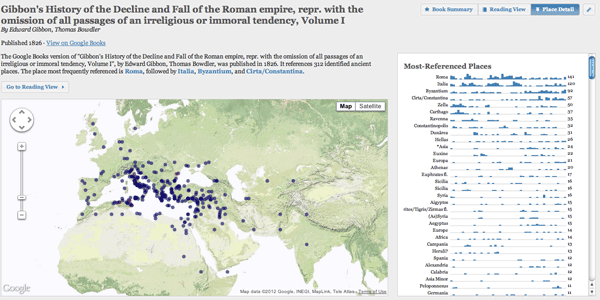 The GapVis beta site has a selection of text including Edward Gibbon’s The Decline and Fall of the Roman Empire, and The Histories by Herodotus (Translated by A. D. Godley). Click on a book to beginning a geographic browsing of the text. A list of places referenced in order of frequency is shown. The frequency list also has mini bar graphs to show when references to each place occur within the text. A map plots the location of all referenced pages for the entire book. 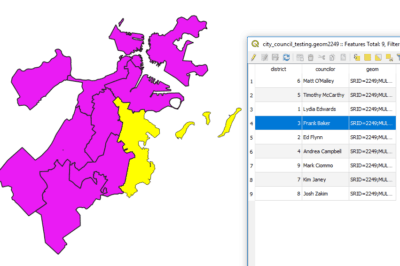 Click on any section of the bar graph for a place and you are transported to a map showing the location of the place along with any other places referenced within the same area of text. There is a timeline at the bottom of the graph, with the timeline representing the page numbers of the text. 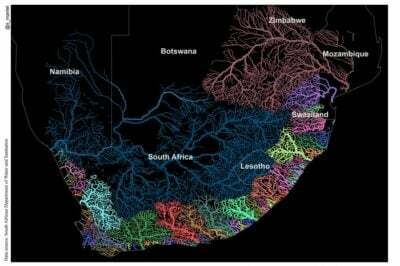 The places are color coded based on their frequency of reference. The left panel of the app highlights the places referenced with the original text of the book. GapVis takes the analysis further by analyzing the location of places in relationship to other places. Clicking on a location on the map from the initial book page allows the user the ability to see how that place is referenced in conjunction with other places. The width of the leader lines from the originating place to the secondary place give the reader a visual on how many times that secondary place is co-referenced. This is a great resource for researchers and for those that want to be able to better understand the geography of the ancient world. Dr Leif Isaksen, the project leader explains, “A GAP user can not only see how an author’s narrative moves from place-to-place, but also how a town or city’s relative importance varies throughout a historical text.” Future plans include geofrerencing places from not just non-fiction but also novels and poetry. Historical Geography and GIS – more about the use of geospatial technologies in historical geography.